First off, a birthday-shout out to my sister's boyfriend Jack! 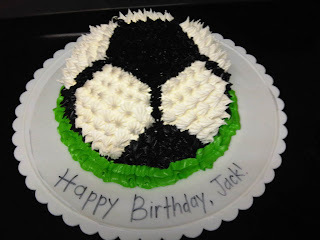 To surprise him on his birthday, I decided to create a soccer ball cake because Jack is British and loves to watch and to play soccer. (He is actually currently on his college's team.) Because I have never created a spherical cake before, this should be interesting. I did a lot of research and decided I did not want to buy a special pan. Instead I went searching for a Pyrex glass mixing bowl, which is round enough. Due to lack of time, I was not able to find a mixing bowl and had to settle for a rounded glass Tupperware container by Pyrex. Jack likes carrot cake and since I've never made carrot cake before, this would be a fun time to try! I loved how the carrot cake's texture and density came out! It was so yummy... like a muffin! Because it was dense, I was able to carve and shape the cake into a half-sphere without any crumbs. First, I covered the cake with a thick layer of cream cheese frosting (just because carrot cake and cream cheese HAS to go together... yum!). Once that was settled, I outlined the pentagon and hexagon patterns onto the cake. 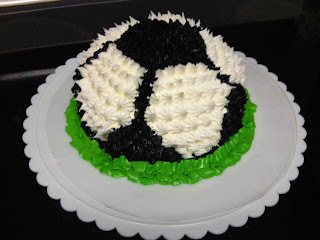 The soccer ball pattern was surprisingly hard to figure out. Then I finished by piping the black spots on the cake. Hmmm... something is missing. 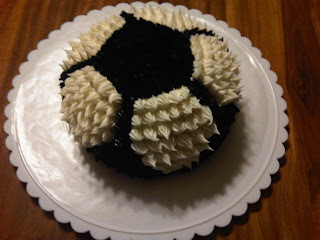 I decided overcome my laziness and also pipe in the white area of the soccer ball. I was glad Miss Amy was available via text/gchat to help me decide what looks best. 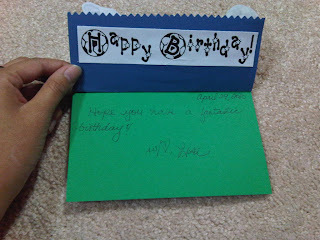 And a birthday message (I was too lazy by now to pipe the words on so handwritten Sharpie will do).... and voila! 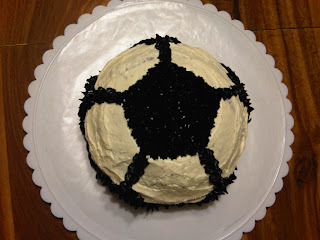 I am pretty please with my soccer ball cake. I hope Jack likes it! Shhh! It's a surprise... his birthday isn't until Thursday, April 29th. One big downside of using buttercream... the clean-up. Such a big mess. I've also been meaning to post some of my other (non-edible) creations on here, but haven't found the time (or energy) yet. 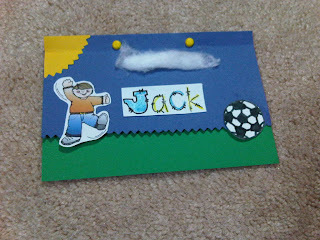 This is a quick birthday card I made for Jack to go along with his cake.